Sabol Studios, has completed another load of terrain for Dragons and Dragoons in Colorado Springs, CO. 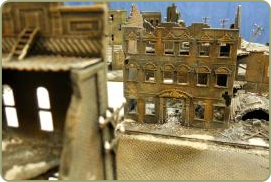 The completed projects include a Battle of the Bulge FOW table, 40K terrain and fantasy terrain. Attention store owners, why not make your store come alive. Contact us for details on how to make your tables the best they can be.